Dear Parent, as I began to think about what I’d share with you, I decided to write a letter. A letter to you, a parent who may be wondering, how do I bring music into the life of my child? How do I find the right piano teacher? Where do I begin? To start with, I want to say, kudos to you! The fact that you’re asking these questions is significant. Providing piano lessons may become one of the most positive things you do for your child. When a child learns to play music, it’s now known that their brain development is enhanced. Scientists are discovering that when a child studies an instrument, it helps them learn and remember things more easily, not just music, but much else, too. That’s because learning a musical instrument, such as the piano, engages practically every area of the brain at once. It’s quite extraordinary! As a child is taught to move their fingers on the keyboard, they learn to navigate the white and black note patterns, developing fine motor skills that are unique to playing the piano. In playing different notes, the student begins to feel the pulse or rhythm of the music. This is experienced in the hands, and in the entire body. As they play melodies and harmonies in rhythm, they learn to express the beauty of the music, to play with feeling. In all of this, the child is working towards a goal, providing a sense of achievement and satisfaction. For these reasons and more, learning to play the piano can enhance your child’s cognitive and emotional development for a lifetime! Interestingly, your question, “How do I find the right teacher?” is relatively new. In generations past, many parents didn’t ask this question. They didn’t realise they could ask it. If someone was teaching in the neighbourhood or at school, it was assumed that he or she was qualified and would suffice. Unfortunately, as I’ve learned from many of my older students, that wasn’t always the case. I’ve worked with many adults in their 60’s, 70’s, and even 80’s. They’d often describe a teacher from decades ago–someone who’d rap them over the knuckles with a ruler if they didn’t hold their hands properly, or chastise them, or say they weren’t musical. For some reason, this seemed to happen a lot. And it left an indelible impression on the student. As a result, the student grew up concluding that they’d failed, that they were incapable of creating beautiful music. But then years later, something would inspire them to play the piano again. With courage, they’d look for a teacher and somehow find me. As we worked together, they’d become relieved and happy to discover that none of those conclusions was true! So you see, dear parent, your child is fortunate. Your effort to find the right teacher may very well change your child’s life for the better from now on forward! When I was growing up, I was lucky. My mother asked the same question that you’re asking. My mother played the piano and loved music. But she knew that she had to find someone else to teach me. “It’s hard to teach your child anything, especially if that child is a daughter!” she’d quip. So, my mum looked around. Like you, she wanted to find the right teacher. And she did. When I was eight, I began piano lessons. Every Tuesday afternoon after school, I’d arrive at my teacher’s house. Her black Labrador would greet me with friendly licks and a wagging tail. My teacher was very kind. She’d offer me little pieces to learn. One was called, “Pony Trot,” and there was “Short Story” and “Novelette,” by a Russian composer named Dmitry Kabalevsky. These were beautiful little pieces, and I remember them to this day. My teacher always let me play the songs I loved best. Importantly, it was also fun to make up my own little pieces too. In my young handwriting, my teacher helped me write the notes of the left hand, descending down the scale, and simple melodies in the right. The seeds of the music I make now were there in those early creations. As time went on, I advanced to pieces by Mozart, Brahms and Debussy. My teacher helped me understand how every phrase can sing, how music can breathe and come to life. She taught me that the last note is especially important, as the sound fades away, and the music floats into silence. Now fifty years later, it’s wonderful to share these memories with you, so you can see how a child’s learning of music stays with them for a lifetime. Indeed, my early studies made me the pianist I’ve become, the teacher I’ve become, and the person I am. So, as you embark on finding a piano teacher, I want to say that you’re in the best position to determine if a teacher is well suited to your child, because you know your child so well. And I want to stress that you don’t have to have any musical training to make this determination! You simply listen, and investigate, and trust your gut. I realise that’s not very scientific. But the impulse that led you to ask the question, “How can I find the right piano teacher for my child,” is all you need. Just keep following it. I really mean that. As you begin, look around, ask friends, search online, check the local music store. Is anyone teaching in your neighbourhood or area? Is a friend’s child studying with someone they like? Does the music store have a recommendation? Follow different leads. Then have a phone conversation with the prospective teacher. Ask about their qualifications, their approach, and their philosophy. Tell them a bit about your child. How do they respond? What’s the feeling you get in speaking with them? Once you’ve committed to a lesson with a teacher, ask to sit in. You can observe, unobtrusively. If not at the first lesson, perhaps the second or third. I’ve listed this first, because I believe that a teacher’s humanity is as important as their musical expertise. In fact, it’s possibly more important. When empathy, kindness and understanding are present, whatever is to be learned, will be absorbed readily by your child. Your child will feel happy, and they’ll want to continue their piano studies. Your child’s happiness will permeate his or her life and help them learn music, and much else, too! A teacher’s musical sensibility is essential, and is often related to their human qualities. Gently inquire with the teacher about their musical background. Ask him or her to play for you and the child. I realise this is delicate, but it can give important insight. What do you think of his or her music? Trust yourself. Are they proficient? Is the music beautiful, expressive, deep, and powerful? In general, a pianist who plays beautifully is in a better position to convey that to your child. Ask a teacher about his or her approach to teaching. A seasoned and thoughtful teacher will be able to explain how they approach teaching, and why. Does their explanation make sense to you? Does it seem valuable for your child? Again, trust yourself. Even if you’re not adept at music, it doesn’t matter. The clues will be there to tell you if you’re making a good choice. Communication is important when finding the right piano teacher. Is she or he able to explain the lesson in a way that makes sense to your child? The ability to explain concepts, as well communicate the feeling and emotion of the music, is essential. A good teacher makes sure that the student is learning, and doesn’t leave the child behind. This is an expression of care. Every child is different! Is the teacher, teaching by rote? Or is the child learning in a way that’s original and dynamic? Ask yourself, what is the quality of the teaching? The way in which a teacher imparts the lesson is as important as what’s being taught! If you continue with the teacher, ask yourself, is my child making progress over time? Are they enjoying the music they’re studying? Is your child feeling positive about their experience of the lessons? If so, that’s good. It means that studying the piano is becoming a positive part of your child’s life! 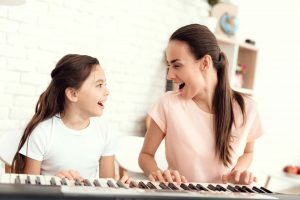 Finally, I want to say that your asking the question, “How do I find the right piano teacher,” reveals something about you as a parent in a very positive way. First and foremost, it is an expression of love. And if you succeed in finding a good teacher–which I hope you do!–studying the piano will yield wonderful benefits for your child. It will help your child feel that they’re capable of progress; that they’re worthy of being supported in their learning; that they can achieve and succeed. It will reveal the beauty that’s there inside of them. And finally, through their music, they’ll feel wonder and joy and be able to bring that joy to others. If you find the right piano teacher, your child will experience all these things! So, dear parent, as I was traveling home from the Roland Corporation, I thought to write to you, to offer what I’ve learned in thirty-five years of teaching students of all ages. I’m grateful to Roland for giving me the opportunity to share these thoughts with you. I hope they help as you endeavour to bring music–the most glorious and beautiful of art forms–into the life of your child.